Again, my thanks for all your kind comments and e-mails. We are slowly adjusting to (but NOT liking) life without Gwen. Every day I miss hugging and kissing her and seeing her smile. At the same time I am so relieved that she is at peace. I’ve really missed blogging but feel it is no longer appropriate to be Gwensmom at Gwenshouse. That was my life for almost thirteen years, and I would not trade it for anything. But now it is time for something else. I’m making slow progress on determining what to do next. (Suggestions are welcome!) But in the meantime, I want to keep up the conversation with you, my wonderful online friends. You all kept me going through some very tough times when I was limited to the house and the keyboard. Many of you have asked if there is anything you can do for me and the answer is YES YES YES! 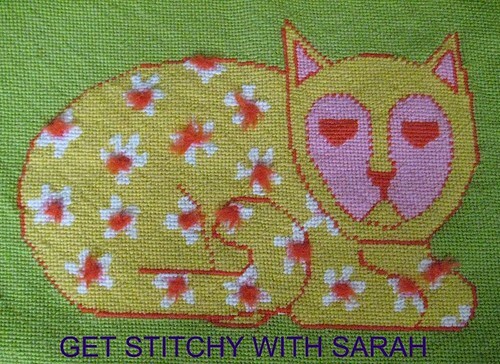 Come with me to my new blog GET STITCHY WITH SARAH. Lurkers, that includes you too! We are going to sew and knit and who knows what else. There is also a new matching Flickr account, Getstitchy, with photos of all the old projects and a few new ones added already. Although my future is still uncertain, I know I want you all in it. So click on the groovy 70’s needlepoint cat above and let’s go! This entry was posted on February 3, 2010 at 4:48 pm and is filed under Uncategorized. You can follow any responses to this entry through the RSS 2.0 feed. You can leave a response, or trackback from your own site. I’m glad to “see” you again online. Gwen can never be forgotten….and neither will her #1 cheering duel (aka her mom & dad) be far from our thoughts and prayers. As fate would have it, I recently watched a 1970′ sitcom yesterday….The Nanny and the Professor….your cat would have fit right in with the decor. Can’t wait to try out your new site. Take care of yourselves.